Last weekend, I was treated to a weekend in Gorgonzola, Italy, by my sister and brother-in-law, as an early birthday present. And I have to say, while this was my second trip to Italy, it is a place I love very much. And I can confirm that Italian food is definitely some of my favourite. 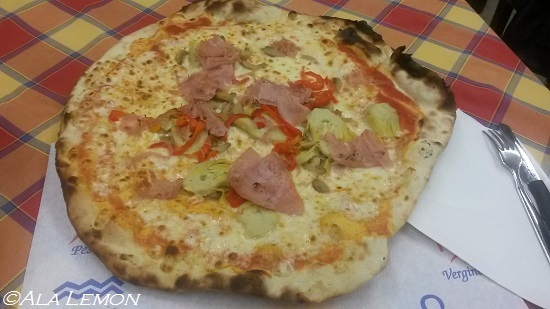 And trust me, I’ve had pretty much every Italian staple food you can imagine … and more! We arrived in Gorgonzola, near Milan, late on Friday afternoon. We met for dinner with a couple of my brother-in-law’s friends, Maurizio and Sofia. As any Mediterranean woman, Sofia is an amazing cook and had prepared a feast. The idea was to present dishes made with local products. For starters, Sofia had prepared some antipasti of sun-dried tomatoes, baby artichokes, stuffed olives, etc… there was also a plate of hams (speck, Parma, crudo), as well as Russian salad made by her mum. Oh, and a bowl of some delicious homemade pickled vegetables. Those were amazing!! The main dishes were ragu, best known as Bolognese sauce (except that Italians don’t call that Bolognese, just ragu), a stew of sausage and peppers, and, my favourite of all: homemade polenta. Now, this one is my favourite, because Maurizio and Sofia had a large chunk of gorgonzola cheese on the table (apparently, someone had tipped them off that I love cheese) and Maurizio told me there was nothing better than polenta topped with gorgonzola. Did I try it? Definitely! Was it as good as it sounds? Oh yes! And so much more!! Believe me, it was really, really, really, really good!! If my stomach hadn’t been pretty full already, I would certainly have had the entire bowl of polenta with the entire piece of gorgonzola!! And because any good meal wouldn’t be complete without dessert, we got the legendary tiramisu. Tiramisu is a dessert I didn’t particularly like as a child. That is, until my math teacher in middle school, who was Italian, brought some for the last class of the year. 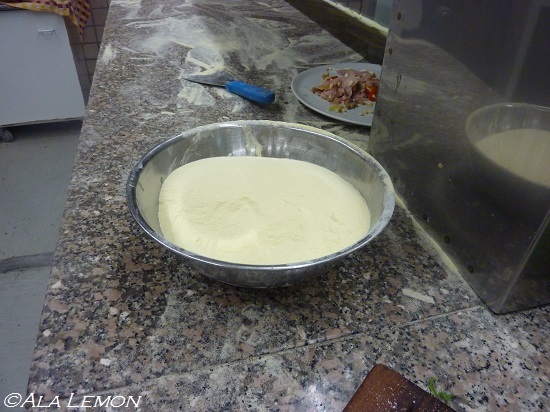 So I had a taste and left school that day with the recipe. I have done it many times, but none as good as Sofia’s. 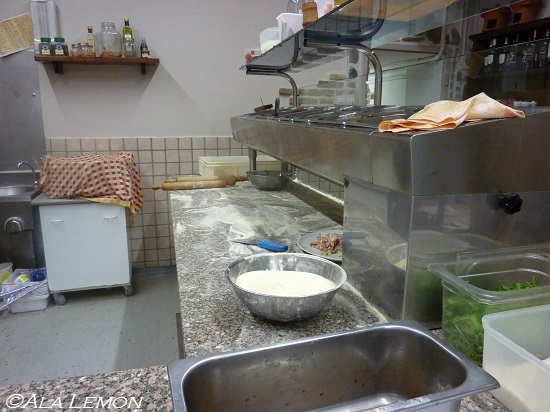 We spent the following day in Verbania, which is where Maurizio and Sofia are from. While Milan and Gorgonzola are in the Lombardy region, Verbania is on the shore of Lake Maggiore in the Piedmont region. We had a walk around the town before meeting and having lunch with Maurizio’s father, who is absolutely adorable and reminded me of my grandfather. We had lunch at a little restaurant overlooking the lake, and it was quite a view! And lunch! 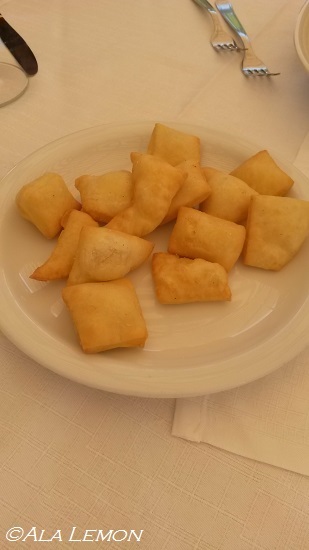 Gnocco fritto is bread dough enriched with lard and fried. It can then be split open and stuffed with cheese and ham, but ours were simply topped with salt and pepper. And they taste as good as they look! Believe me, it’s impossible to have only one! 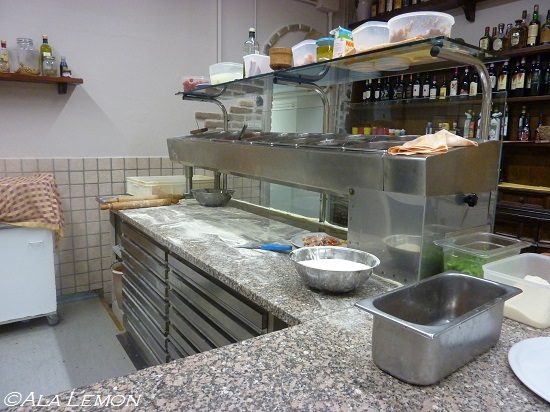 The rest of the dishes were fairly “classic,” comprising of risotto Milanese (a simple risotto with saffron), raviolis with sage and butter, orecchiette with pecorino, ratatouille, fried calamari, and a juicy steak. After lunch, we said our goodbyes with Maurizio’s father and went to visit the botanical garden of the Villa Taranto. The gardens were founded by Captain Neil McEacharn in 1931. I cannot remember the circumstances which led to the creation of the garden, but I can tell there are thousands of varieties of flowers and trees from all over the world. Back in town, we went for a gelato (what else?) at a lovely gelateria called Gelati d’Altri Tempi. 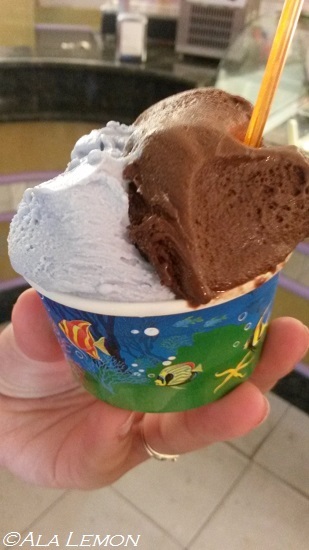 They have some classic flavours (chocolate, vanilla, strawberry, lemon…) but the most surprising one was probably the violet gelato. Yes, violet, like the flower. Now, violet is not something unknown to me. These little purple flowers have been crystallised or turned into candies for centuries in the south of France. But gelato was definitely new to me, and quite surprising. I found the taste of violet to be quite strong, so I think this is the kind of food just you need a few little bites of. We enjoyed one last stroll in Verbania before taking the road back to Gorgonzola… or should I say, the boat. Sofia and Maurizio treated us with a “shorter route” for which we crossed Lake Maggiore from one shore to the other. The views on each shore were splendid, and I love being on the water, so I enjoyed that short crossing very much … except for that moment when I confused a seagull for a buoy, but that’s another story. Later, we went out to dinner in Vailate, which is located about an hour from Gorgonzola. 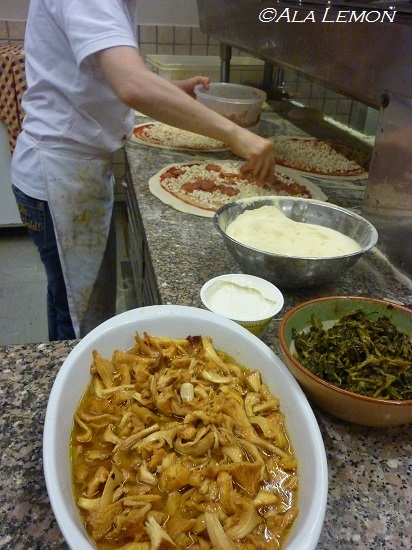 We went to a small, friendly pizzeria called Sport. 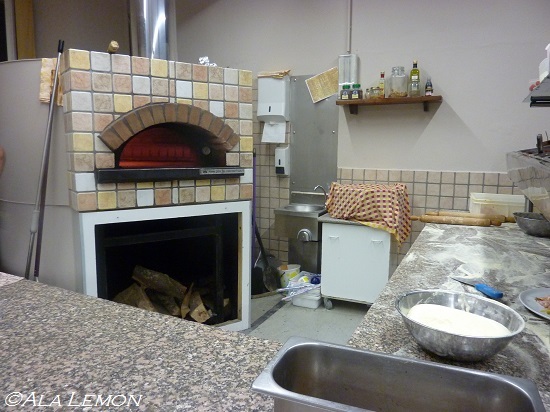 Having already had real Italian pizza, I was expecting them to be good. What I was not expecting, however, was their size. 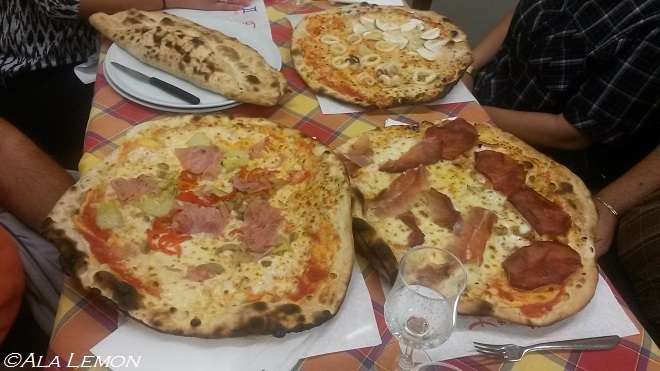 Maurizio and Sofia informed us that, unless otherwise stated, we would be served the “large” pizzas. And boy were they right!! 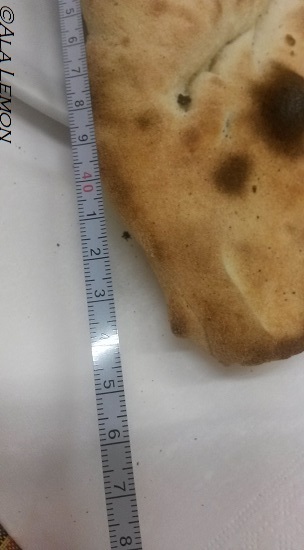 Out of sheer curiosity, I took out my measuring tape and I kid you not, these pizzas were 45 cm in diameter! Here’s proof! 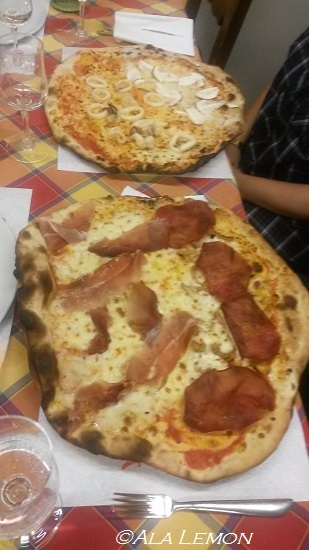 Size aside, the pizzas were delicious. Sofia’s had fried calamari on one side, and parmesan and fresh porcini mushrooms (which I found out I prefer to cooked porcini) on the other, and Maurizio’s had gorgonzola (of course! ), prosciutto and bresaola. My sister and I “modestly” shared a calzone stuffed with ricotta, spicy salami and prosciutto. 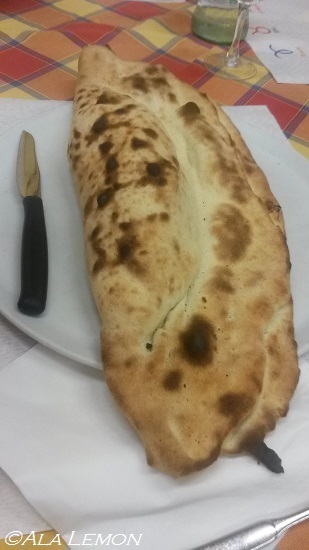 I’m using quotation marks, because there was probably one entire container of ricotta in that calzone! 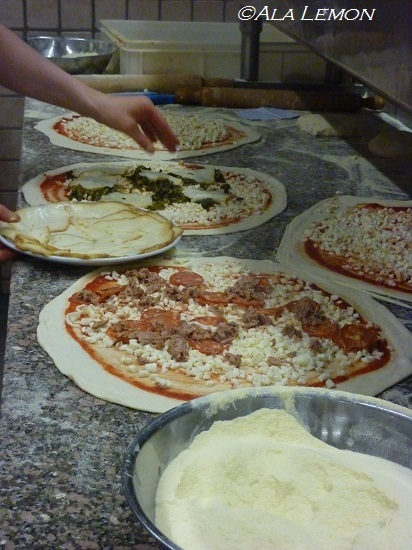 As you may guess, all the pizzas are homemade and made on demand. We’d seen other tables ordering it, so we ladies shared one. 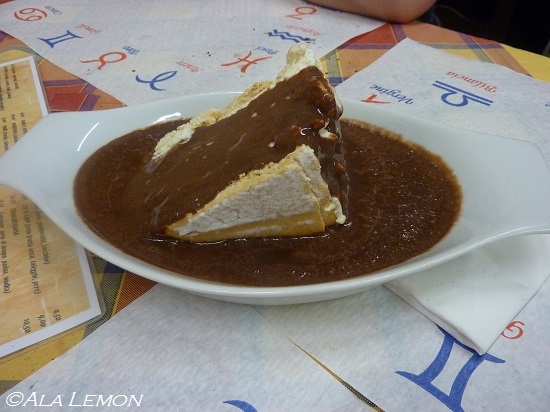 It is a sort of ice cream meringue tart, consisting of 2 meringues sandwiching a thick layer of cream gelato, and swimming in a liberal amount of chocolate sauce. After that, I was almost happy for that glass of Limoncello. Right, I have to say, I rarely drink. The main reason being that I don’t like the taste of alcohol – the secondary reason being that alcohol makes me sleepy. Anyway, as I had told Sofia and Maurizio the previous day that I did not drink, or very little, it seems some sort of plan was devised to make me drink. So, willing or not, I was systematically served a glass of Limoncello at the end of each meal.